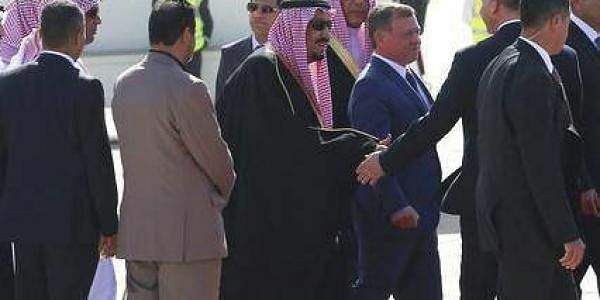 SWEIMEH (JORDAN): Arab leaders are set to meet in Jordan on Wednesday for their annual summit with no expected breakthrough on resolving conflicts or "terrorism" in the region. Saudi Arabia's King Salman is among 22 leaders attending the Arab League for the meeting in Sweimeh on the Dead Sea coast from 0900 GMT. UN chief Antonio Guterres and his special envoy for Syria, Staffan de Mistura, are also expected to be present. The leaders are set to discuss the wars in Syria, Iraq, Libya and Yemen, the fight against "terrorism" and the Israeli-Palestinian conflict, according to Jordan's information minister. "I think this summit won't be any different from the previous Arab summits," said Oraib al-Rantawi, head of the Al-Quds Centre for Political Studies. "The Arab (political) system is weak, divided and has been plagued by defects for years," he said. The 22-member bloc has struggled to resolve any of the conflicts that started after the 2011 Arab Spring uprisings, including Syria's devastating six-year war. Arab League chief Ahmed Abul Gheit on Monday called on Arab leaders to play "a more active role" in finding a solution to the war, describing it as "the worst crisis in the region's recent history". Syria's President Bashar al-Assad has not been invited to the summit since 2011, when the brutal repression of anti-government protests led to armed conflict involving world powers. Saudi Arabia supports the Syrian opposition, while the Gulf heavyweight's main regional rival Iran backs the Assad regime. On Tuesday, Guterres called on Arab leaders to set aside their differences to confront Syria's war, which is estimated to have killed more than 320,00 people and displaced millions. "Arab unity is a very important element in order to allow this region to be stabilised and for... the Syrian refugees to find again a future that corresponds to their aspirations," he said. Member states are also expected to discuss the battle against the Islamic State group, which they describe as "terrorist". The group is facing US-backed offensives in Syria and neighbouring Iraq. Also on the agenda is the Yemen conflict, which escalated in 2015 with the military intervention of a Saudi-led coalition in support of embattled President Abedrabbo Mansour Hadi. Riyadh accuses Tehran of backing the Shiite Huthi rebels in the war that has killed more than 7,700 people since March 2015 and left parts of the impoverished country on the brink of famine. Arab leaders will discuss Libya, where a UN-backed unity government has struggled to assert its authority, and the decades-old Israeli-Palestinian conflict. A draft statement to be put to the summit opposes plans by US President Donald Trump to move Washington's embassy in Israel to Jerusalem and consider alternatives to a Palestinian state. Sudan's President Omar al-Bashir will also attend, his foreign minister has said, despite Human Rights Watch urging Jordan to deny the leader entry or arrest him if he did. Bashir is wanted by The Hague-based International Criminal Court for alleged genocide and war crimes related to the conflict in war-torn Darfur.